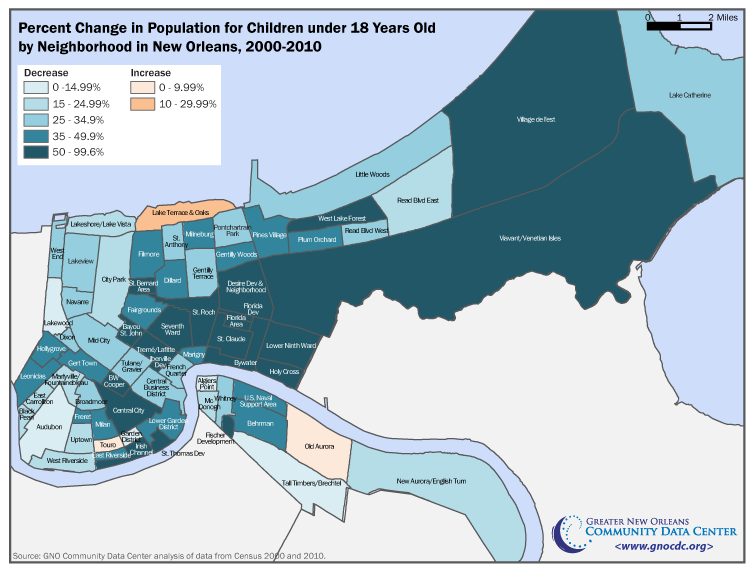 Children under 18 are a declining share of the population in the vast majority of New Orleans neighborhoods. The neighborhoods that experienced the largest disproportionate losses from 2000 to 2010 include public housing sites that are undergoing redevelopment—reminding us that New Orleans children are more likely to live in poverty than the national average. Today children in New Orleans live in less densely situated housing than before the storm. New Orleans has lost 283,696 total residents since its peak in 1960—about half of that occurring over the last decade when the city lost 140,845 residents, or 29 percent of its population. According to 2010 Census statistics, children under 18 years old may have been the least likely demographic group to return following Katrina. 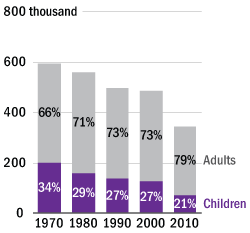 From 2000 to 2010, the number of children in New Orleans has decreased by 56,193, or 43 percent. Research on previous disasters indicates that families with children are less likely than the rest of the population to return to a disaster area . However, it is important to recognize that children were a declining share of the New Orleans population before 2000—falling from 34 percent of the city’s population in 1970 to 27 percent by 2000, and finally to 21 percent by 2010. Thus, the loss of children post–Katrina may be, to some extent, the acceleration of a trend that was already observable before the massive displacement and redevelopment of New Orleans neighborhoods. This brief examines changes in the number of children under 18 years of age by neighborhood from 2000 to 2010, as well as the current distribution of children across the city. Sources: The Data Center compilation of data from U.S. Census Bureau. Children are a declining share of the population in the vast majority of New Orleans neighborhoods. Only three New Orleans neighborhoods experienced an increase in the number of children over the last decade and in each case the increases were very minor. Specifically, Old Aurora, Touro, and Lake Terrace & Oaks gained 9, 10 and 52 children respectively. While the Central Business District, Audubon, Lower Garden District, Algiers Point, and New Aurora/English Turn all gained total population, they did so while losing anywhere from 24 to 415 children. All told, children under 18 have declined as a share of the population in 59 out of New Orleans’ 72 neighborhoods over the last ten years. In eight neighborhoods, the share of the population that is under 18 years old has declined by more than ten percentage points. The six neighborhoods that experienced the largest disproportionate loss of children encompass public housing sites that have undergone major redevelopment, including B.W. Cooper, Iberville Development, Treme’/Lafitte, St. Bernard Area, St. Thomas, and Fischer. The Irish Channel and Bywater experienced the next largest disproportionate loss of children over the last ten years. Although the Irish Channel did not flood, it lost 63 percent of its children compared to only 21 percent of its total population since 2000. Similarly, the Bywater, which largely did not flood, has lost fully two–thirds (67 percent) of its population of children compared to only 35 percent of its total population. The disproportionate loss of children is likely a result of gentrification, which is accompanied by an increase in housing prices . These trends point to the fact that families with children in New Orleans tend to earn lower incomes than other families. In 2009, the median income of families without children was $46,997 in Orleans Parish, while the median income for families with children was only $37,310. Fully 35 percent of New Orleans children under the age of 18 lived in poverty in 2009 compared to 20 percent nationwide (U.S. Census Bureau, American Community Survey 2009). In three additional neighborhoods, the share of children has dropped by exactly ten percentage points: Central City, St. Claude and Village de L’est. 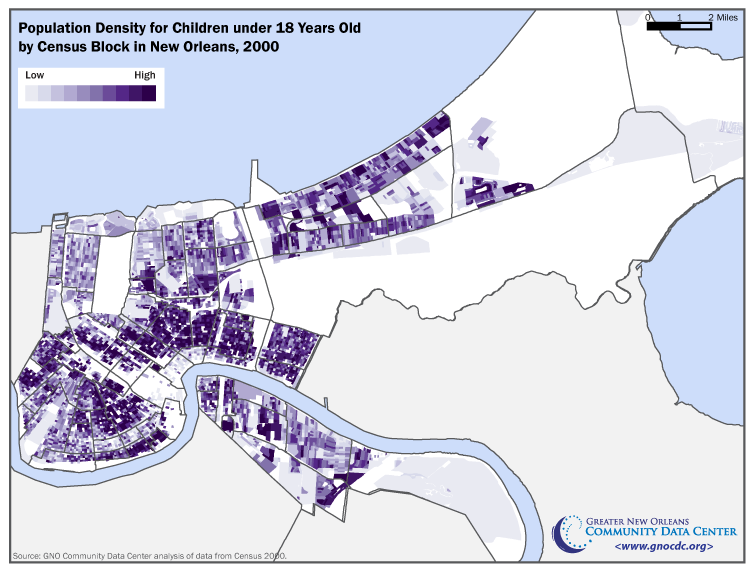 Not only do fewer children live in post–Katrina New Orleans, but now children live in less densely situated housing. Today the neighborhoods that have the highest density of children are quite different than ten years ago. Although Iberville still has the highest density of children in the city, next on the list of neighborhoods with high densities of children are the Seventh Ward, Broadmoor, Freret, Milan, and Hollygrove. The reopening of Lafitte (now Faubourg Lafitte), the St. Bernard development (now Columbia Park), and C.J. Peete (now Harmony Oaks) provide or will provide additional housing for low–income families, but these developments are now less dense than they were in 2000 and will house fewer families over the same acreage. The new distribution of children across the city will be important for planning services for families and children citywide. Source: The Data Center analysis of data from Census 2000 and 2010 and USGS National Landcover Database 2001. *Population of two blocks (bordered by Derbigny St. on the north, Claiborne Ave. on the south, Cleveland Ave. on the west and Iberville St. on the east) are included in the Central Business District in 2000, and in Tulane/ Gravier in 2010. **Population of the “Desire Area” and “Desire Development” neighborhoods is summed together as the “Desire Dev and Neighborhood” due to changes in 2010 census tract boundaries. Studies of the accuracy of the Census 2010 count will not be undertaken until more Census 2010 data has been released. However, studies of earlier decennial censuses provide guidance as to likely limitations of the Census 2010. A state–specific study of the Census 2000 undercount conducted by PricewaterhouseCoopers concluded that Louisiana’s population in 2000 was undercounted by 60,698 or 1.34 percent . Studies of both the 1990 and 2000 decennial censuses concluded that American Indians, Asians, African Americans, Hispanics, and children were most likely to be undercounted . And a study of the 2000 decennial census concluded that some people were double counted, including college students living away from home, and families counted at both their main and vacation homes. These people were more likely to be white and higher–income . The Data Center will publish more analyses of children by detailed age groups this summer when the Census makes this data available. Alan Kirschenbaum, “Residential Ambiguity and Relocation Decisions: Population and Areas at Risk,” International Journal of Mass Emergencies and Disasters 14 (1) (1996): 79–96. Ericksen, Eugene. “An Evaluation of the 2000 Census and Census Bureau Efforts to Measure the Gross and Net Rates of Undercount,” 2001. North Dakota Law Review, 77 (753).